One thing that has distinguished Mike Birkbeck over the years has been his relentless pursuit of excellence in everything he pursues. This has gained him many honors in his athletic career to this point and will continue into the future, I’m sure. Watching him play as a junior varsity basketball player at Orrville, you could tell that better things were in store for this young man. This was proved as he earned three varsity letters in basketball and all-conference (All-Ohio Conference) and all district all-star honors, as well as being co-captain and team co-MVP in his senior year. Birkbeck also lettered twice in golf at OHS and was all-conference in his senior year. As impressive as this all seems, Mike’s real forte has been baseball and his career is still active in this area. In Orrville, Birkbeck pitched and played hard enough to earn four varsity letters, MVP, all-conference twice and all-district all-star. He carried a batting average of .381, pitched two no-hitters, scored 23 runs, stole 23 bases, and had an ERA of 0.72. Hot stove baseball has been a part of the total package of Mike Birkbeck, as he played for the Hahn-Frank team of the late 1970’s. His success was evident there as well. While at Akron, Mike earned four varsity letters, Ohio Valley Conference Player of the Year twice. All-American in 1983, and was recently selected to the all-time (40 year) all-conference all-star team. In 1982, Birkbeck was selected in the free agent draft to play professional baseball, but he opted to finish his senior year at Akron instead. 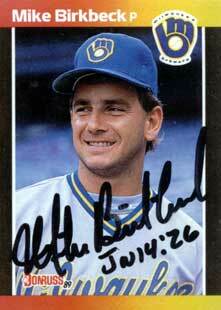 The Milwaukee Brewers drafted him in 1983 and he is with that team today. His best year so far has been 1988, when he finished 10-8 with a 4.69 ERA. Nagging injuries have not allowed Mike to show his true championship ability to this time. Mike Birkbeck and his wife, Suzanne call Canton their home now during the off-season.